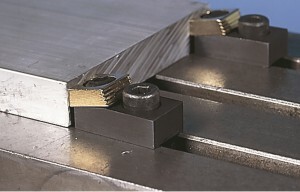 This clamp is similar the Compact Toe Clamp, only it is designed to be used in the T-slots of machine tables. It provides 4,000 lbs. (17800 N) positive down force while maintaining a low profile. The hardened steel clamping element has both a smooth surface for machined workpieces and a serrated clamping surface for rougher work. F1 – The distance from the top of the back of the washer to the bottom of the clamp body. F2 – The distance from the top of the front of the washer to the bottom of the clamp body. Torque mounting bolt to 110 ft. lbs. Torque mounting bolt to 150 N.m.